Inflammatory skin diseases like psoriasis, atopic dermatitis (eczema), vitiligo, itch (pruritus), lichen planus, mycosis fungoides and vitiligo can have a tremendous impact on quality of life. Not only do many patients suffer from associated symptoms that range from itching to burning and pain, but the appearance of affected skin can be extremely stigmatizing. Fortunately, in many cases, sunlight is the answer. Phototherapy (or light therapy) has been used to treat inflammatory skin diseases for over 100 years. Most phototherapy currently consists of a specific wavelength of sunlight called narrowband ultraviolet B (range 311-313 nm). Narrowband UVB (nbUVB) decreases the inflammatory cells in the skin that have caused inflammation leading to improvement in both symptoms and appearance. Based on studies, this type of phototherapy poses minimal risk of skin cancer and may be safe for children and pregnant women. Many patients undergoing phototherapy can avoid having to use topical or systemic medications, which generally carry greater risk of toxicity. The phototherapy unit is a booth lined with long, cylindrical UVB light bulbs. These bulbs emit therapeutic light rays. Most patients start with 3 treatments per week. With each treatment, the dose of phototherapy and the time spent in the booth increase incrementally. In many cases, improvement can be seen after just a few weeks. Once the skin has cleared, phototherapy treatments are tapered. Side effects of phototherapy are rare, but include a sunburn-like reaction that generally fades quickly and dry skin. While research has shown that phototherapy with nbUVB poses minimal risk of skin cancer, it is important to have yearly skin cancer screenings while undergoing treatment. At Spring Street Dermatology, we offer full body nbUVB phototherapy for widespread eruptions and targeted Excimer phototherapy for more localized or hard to reach areas like the scalp. The office is open for treatment Monday through Friday from 8 am to 8 pm and on Saturdays and Sundays from 9-5 pm. 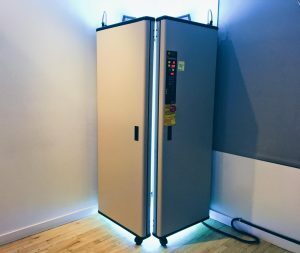 If you are suffering with psoriasis, eczema (atopic dermatitis), itch (pruritus), mycosis fungoides, lichen planus, vitiligo or any other inflammatory skin condition, call 212-431- 4749 for a consultation with one of our dermatologists to see if phototherapy can help.